Many Legionnaires throughout the Department of Virginia purchased tickets for the raffle of a beautifully engraved American Legion Centennial Commemorative 45 caliber pistol and matching serial number Department of Virginia coin. Funds from the raffle supported the American Legion Centennial held on March 23, 2019 at the Richmond Marriott Downtown in addition to American Legion charities. The winner of the raffle was Wayne Mead, Commander of Post 113 in Virginia Beach. The winning ticket was drawn at the Centennial Gala, and Jim is now the proud owner of a one of a kind collectible which came with a wooden display case as well. The Centennial Gala Committee is extremely grateful for all of the wonderful Legionnaires who purchased tickets for the raffle. This was truly a once in a life time event. The Legionnaires of the Department of Virginia should be extremely proud of the terrific Gala event and their support of this raffle. 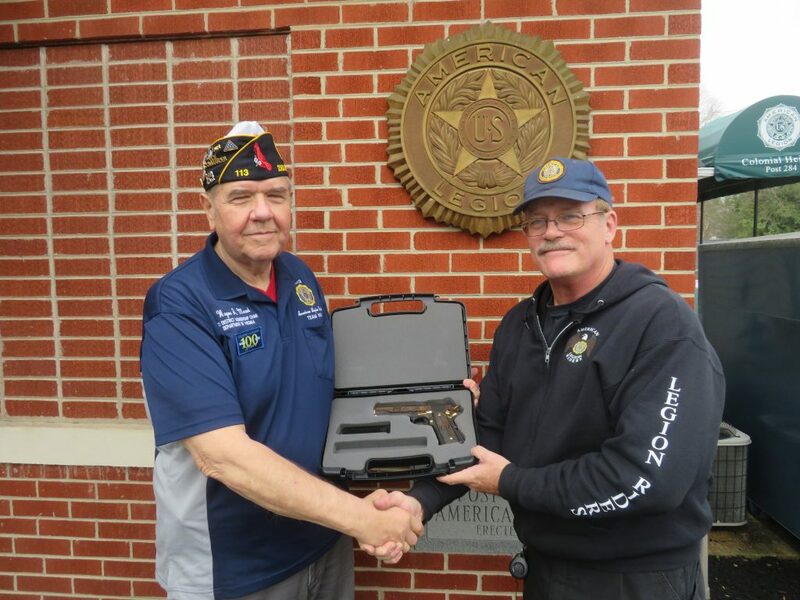 Centennial Gala Chairman Jim Althouse (R) presents Wayne Mead, Commander of Post 113 in Virginia Beach with the beautiful American Legion Centennial 45 caliber pistol.